Sysadmins are awesome. There’s no denying that at all, but inside every sysadmin is that drive to become even better. That’s why you do what you do, starting way before 9am and working way past 5pm. That’s why you give up your weekends, and spend your time on the beach reading certificate study guides instead of your favorite book. 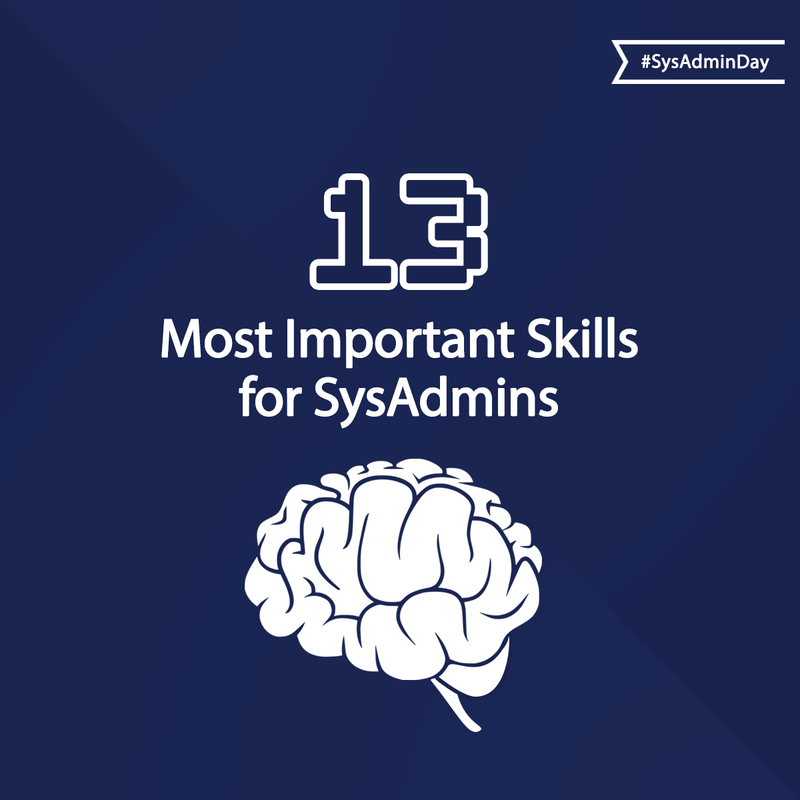 Every sysadmin has a great set of skills, but most sysadmins probably want to develop more. 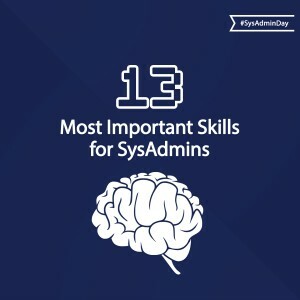 To help you, who so often help us, we’ve scoured the net, including articles from the top job boards, recruiters and head hunters, and we’ve collected a list of the skills that are most important to sysadmins, no matter what their specific focus is. We’ve listed them in no particular order, and included some links to help you start learning these skills online at your own pace. This should be the only skill on this list that is vendor specific, but it is also a skill that every sysadmin should have and so few do. Good diagrams not only make understanding and troubleshooting a system easier, they support good documentation. Most sysadmins’ Visio diagrams look worse than smartphone camera pictures of a whiteboard. We all need to get better at Visio. Check out http://office.microsoft.com/en-us/visio-help/training-courses-for-visio-2013-HA104032123.aspx for free training from Microsoft on Visio. You don’t have to be the network engineer to understand networking. If you admin a system, it uses the network and you need to understand what it requires so you can work with the firewall sysadmin to get the ACLs correct, and the network sysadmin to ensure performance. There is an awesome collection of training videos on networking at http://blog.pluralsight.com/free-computer-training-videos/free-networking-training-videos. IAM (Identity and Access Management) is going to become a critical part of every system in the coming years. It is already going from niche skill to hard requirement in so many projects and IAM gurus are in high demand. There are videos online from virtually every vendor in the IAM space to help you get started. See http://www.bing.com/videos/search?q=free+identity+management+training+and+tutorials&qpvt=free+identity+management+training+and+tutorials&FORM=VDRE for a collection of them. If you’re new to this whole cloud thing, check out http://www.thecloudtutorial.com/ for a great place to start; then focus on the resources from the vendor or vendors who offer services you want. Amazon, Google, Microsoft, Salesforce and others all have good resources for their specific offerings. If you are in a Windows enterprise, PowerShell is the way to go. Check out Don Jones’ awesome collection of training content on PowerShell at http://powershell.org/wp/category/training/. Of course, if Linux is more your thing, or you would prefer not to use PowerShell and want an alternative, Perl may be for you and there is some great content at http://www.perl.org/books/beginning-perl/ to help jumpstart this skillset for you. Security is an extremely broad category, but it needs to be baked into every sysadmin’s repertoire. The SANS Institute is on a mission to raise the security IQ of every sysadmin, and they share some great resources at http://www.sans.org/security-resources/. A critical skill for any sysadmin, see http://ocw.uci.edu/cat/oo/getPage.php?course=OC1305015&lesson=1&topic=1&page=1 for a free course from University of California at Irvine on this. With mobile devices touching everything and in many cases surpassing the PC in importance to their users, MDM (Mobile Device Management) skills will be a hot commodity and sysadmins need to know how to manage the devices that will be accessing their systems. There are various training resources from the specific vendors, and Airwatch is a great place to start. See https://secure.air-watch.com/ for this. It requires registration, but that is free and fast. Whether you use SCCM, Nagios, Splunk, or other solutions, the art of good system monitoring is key. See http://www.microsoftvirtualacademy.com/training-courses/overview-and-infrastructure-changes-in-sccm-2012 for SCCM, http://exchange.nagios.org/directory/Tutorials#/ for Nagios, and http://www.splunk.com/view/education-videos/SP-CAAAGB6 for Splunk. While most companies will have dedicated project managers, understanding more about their job will improve your worth and also make them easier to work with! See http://www.projectmanager.com/project-management-training for a huge collection of free training videos. Every sysadmin has, at some point, needed to write some basic HTML. Rather than hunting and pecking, see http://www.w3schools.com/html/default.asp for some great beginner HTML training. As more and more companies want to operationalize their IT, ITIL continues to be an in demand skill. See http://www.freeitiltraining.com/ for a great start towards understanding, and perhaps even becoming certified in ITIL. 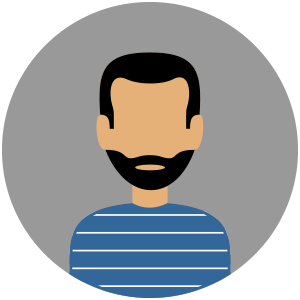 What skills are you trying to add to your sysadmin repertoire and what resources are you using to learn them? Leave a comment and show some appreciation for your fellow sysadmins! Liked this post? 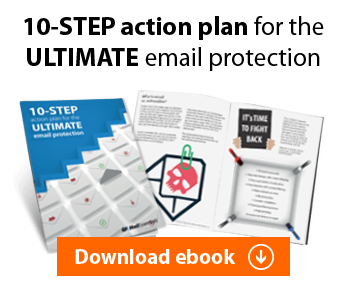 You’ll probably also like our First Aid Kit for SysAdmins eBook. Get it for free today!